a bumbo seat cover? okay, you don't need this item, but there was a reason i never bought a bumbo: they look like they belong in a public pool or in a retirement home! 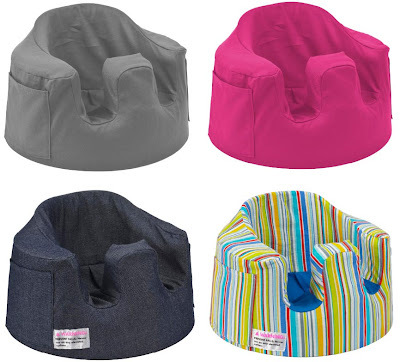 i, of course, knew how amazing these little seats are for babies but my aesthetic snobbery deprived me of its usefulness. keen distribution sent me a grey twill cover to check out. i was instantly won over when i opened the package. the thick cotton twill and strong construction gave this registry staple a modern sophistication i didn't expect. it slips on with a little work, but stays put while baby gets in and out. the cover has a little pocket on the side for what i am not sure, but moms love pockets! so why not? available in a myriad of styles from bright prints to classic denim (not yet available). these seat covers will make your bumbo fit right in with your carefully curated home. i give it two coos and a drool! available at target. My brother got us a Bumbo seat for our baby when he was born and though it has come in handy, it is not an item I would recommend my friends to buy. Not because I don't think it is great - it is! But given the price, I don't think it is worth it. When L. was a bub he prefered being in his baby chair (more comfy)and now that he's older he likes sitting on a regular chair. I'd say get a Bumbo seat depending on your baby budget! I need a print of the Devil Doll cover. Amazing find!